Excellent battery, shame delivery was slow. Should have been next day but it took 3 working days - tracking shows the battery came from Belgium! Quality battery at a sensible price. The battery arrived quickly and with the clear instructions was very easy and safe to fill. The battery worked well with my bike back on the road. I highly recommend Tanya to you. Got it very quickly and did the business. But I killed it, by not disconnecting while bike in hibernation?! 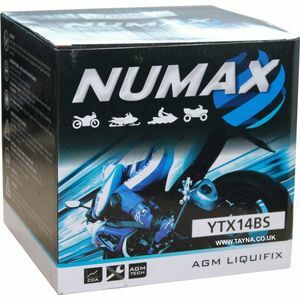 This was bought for a Quad, but I have purchased a Numax battery before for a Bike and they are a very good quality. Service excellent product great price and service. Does what it says on the box,very good value for money. 5 stars for delivery and efficiency. By all reports battery appears good quality and sold at good price by Tayna. Thanks. Good quality batteries, had one a few years ago for the same quad. Seems to hold charge well even when quad not used for long periods and always plenty of power for a quick start.